(Phys.org)—NASA's Mars Curiosity rover has used its full array of instruments to analyze Martian soil for the first time, and found a complex chemistry within the Martian soil. Water and sulfur and chlorine-containing substances, among other ingredients, showed up in samples Curiosity's arm delivered to an analytical laboratory inside the rover. Detection of the substances during this early phase of the mission demonstrates the laboratory's capability to analyze diverse soil and rock samples over the next two years. Scientists also have been verifying the capabilities of the rover's instruments. Curiosity is the first Mars rover able to scoop soil into analytical instruments. The specific soil sample came from a drift of windblown dust and sand called "Rocknest." The site lies in a relatively flat part of Gale Crater still miles away from the rover's main destination on the slope of a mountain called Mount Sharp. The rover's laboratory includes the Sample Analysis at Mars (SAM) suite and the Chemistry and Mineralogy (CheMin) instrument. SAM used three methods to analyze gases given off from the dusty sand when it was heated in a tiny oven. One class of substances SAM checks for is organic compounds—carbon-containing chemicals that can be ingredients for life. 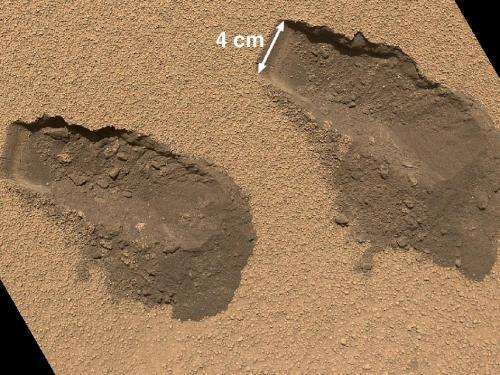 "We have no definitive detection of Martian organics at this point, but we will keep looking in the diverse environments of Gale Crater," said SAM Principal Investigator Paul Mahaffy of NASA's Goddard Space Flight Center in Greenbelt, Md. 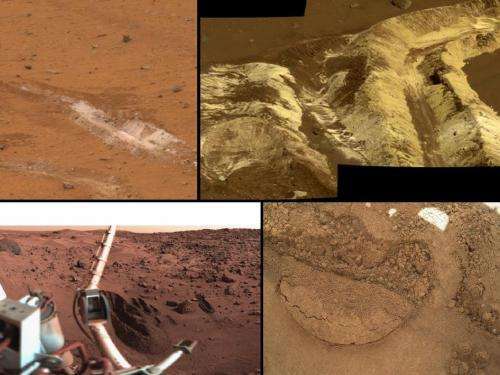 Curiosity's APXS instrument and the Mars Hand Lens Imager (MAHLI) camera on the rover's arm confirmed Rocknest has chemical-element composition and textural appearance similar to sites visited by earlier NASA Mars rovers Pathfinder, Spirit and Opportunity. 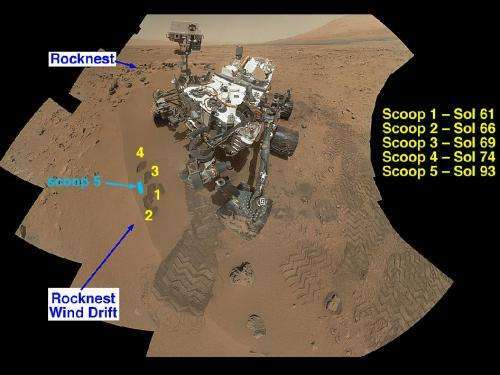 Curiosity's team selected Rocknest as the first scooping site because it has fine sand particles suited for scrubbing interior surfaces of the arm's sample-handling chambers. Sand was vibrated inside the chambers to remove residue from Earth. MAHLI close-up images of Rocknest show a dust-coated crust one or two sand grains thick, covering dark, finer sand. "Active drifts on Mars look darker on the surface," said MAHLI Principal Investigator Ken Edgett, of Malin Space Science Systems in San Diego. "This is an older drift that has had time to be inactive, letting the crust form and dust accumulate on it." CheMin's examination of Rocknest samples found the composition is about half common volcanic minerals and half non-crystalline materials such as glass. SAM added information about ingredients present in much lower concentrations and about ratios of isotopes. Isotopes are different forms of the same element and can provide clues about environmental changes. The water seen by SAM does not mean the drift was wet. Water molecules bound to grains of sand or dust are not unusual, but the quantity seen was higher than anticipated. SAM tentatively identified the oxygen and chlorine compound perchlorate. This is a reactive chemical previously found in arctic Martian soil by NASA's Phoenix Lander. Reactions with other chemicals heated in SAM formed chlorinated methane compounds—one-carbon organics that were detected by the instrument. The chlorine is of Martian origin, but it is possible the carbon may be of Earth origin, carried by Curiosity and detected by SAM's high sensitivity design.